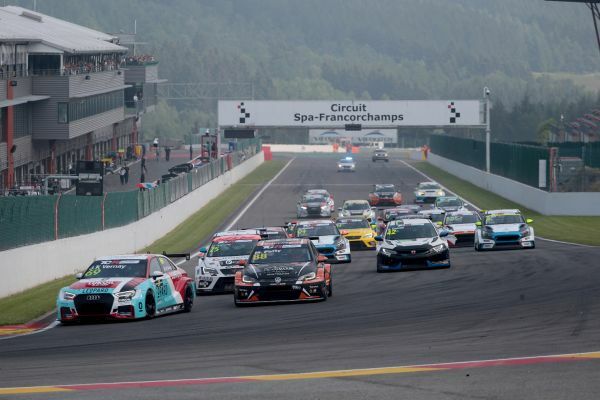 Jean-Karl Vernay has taken his maiden win in the TCR Europe. 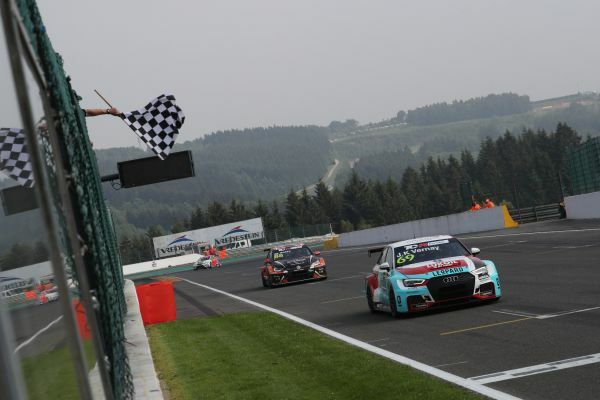 In a warm afternoon at Spa, the Frenchman of Leopard Lukoil Racing drove his Audi RS3 LMS to a lights-to-flag victory from pole position. The only one who could resist his pace was local hero Maxime Potty (Comtoyou Racing Volkswagen Golf GTI), who took a first podium finish in the series. With a solid race, Mikel Azcona (PCR Sport Cupra) took third and most importantly, became the new leader in the overall standings, 5 points clear of Dušan Borković who was classified fourth with a Target Competition Hyundai i30 N.
In the final laps, the Serbian had to defend fiercely his positions from the attacks of Julien Briché (JSB Compétition Peugeot 308), one of the drivers that put the show on the Belgian track. Others, like Stefano Comini, Josh Files or Jens Reno Møller were less lucky and had to retire as a consequence of the tough battles. The Dane had a scary moment at the Raidillon after a contact with Attila Tassi, but luckily he managed to stop before crashing into the barriers. Race 2 will start tomorrow at 14:55, with Danny Kroes on pole on the top-ten reverse grid. Live streaming on www.tcr-series.com and www.tcr-series.tv. Stien Paulsen and Attila Tassi were both given a 30-second time penalty after today’s Race 1 in Spa-Francorchamps. Paulsen was dropped from sixth to 14th as he was considered guilty for having caused the incident in second lap of the race that forced Reece Barr to retire. As for Tassi, he was punished for sending Jens-Reno Møller into a dangerous high-speed spin at the Raidillon while they were fighting for the 11th position on lap 9; this meant that Tassi was demoted from 11th to 17th. Jean-Karl Vernay and Maxime Potty topped the Qualifying session in the morning. The French driver set the pace in both Q1 and Q2 and secured pole position for Race 1. On his home racetrack, Potty claimed his best result so far, qualifying second; it was a similar story for Julien Briché, who was third fastest. Championship co-leaders Mikel Azcona and Dušan Borković qualified in fourth and sixth respectively, with Stian Paulsen splitting them in fifth. The best two Honda cars were Josh Files’ and Stefano Comini’s in seventh and eighth, meaning that cars from six different brands – Audi, Volkswagen, Peugeot, Cupra, Hyundai and Honda – filled the first seven positions. Target Competition teammates Reece Barr and Kris Richard secured the front row on the reverse grid for tomorrow’s Race 2. Danny Kroes and Attila Tassi were the most disappointed. Kroes had several lap times disallowed for repeatedly infringing track limits in Q2, including a 2:29.978 that would have placed him fifth, while Tassi blamed himself for not going through to Q2, saying that he couldn’t quite get his braking points right. The Q1 part of the session was disrupted by the red flag after only four minutes, when Viktor Davidovski went off at Raidillon and crashed heavily into the tyre wall. Qui arbitra le duel au sommet entre Comini et Vernay à Spa-Francorchamps ?